Given the right environment, cKit+ cells from the mouse heart can develop into new cardiac muscle, according to a study. Cells in the heart expressing the marker cKit were once thought to be the key to cardiac regeneration. These cardiac precursors, researchers found, could proliferate—opening up the opportunity for a way to regrow an organ that until this century was thought incapable of regeneration. Specifically, the researchers found that if they interfered with bone morphogenetic protein signaling—crucial during the development of the heart and other tissues—mouse induced pluripotent stem cells (iPSCs) expressing KIT would become cardiomyocytes. They also demonstrated with genetic fate-mapping that cKit+ cells derive from the neural crest during development and are present in the mouse embryonic heart. Hare’s group did not find that cKit+ cells have a high propensity to become endothelium, as did the aforementioned 2014 study, which also used genetic fate-mapping. Jeffery Molkentin of Cincinnati Children’s Hospital Medical Center who led that work declined to be interviewed for this story. Hare said the discrepancy could be due to the teams’ different genetic constructs. The paper is more qualitative than quantitative, said Nadal-Ginard, meaning researchers still don’t know how often cKit+ cells become myocytes and whether they become other types of cells (and at what frequency). Michael Kotlikoff of Cornell University pointed out that Hare’s team didn’t demonstrate that cKit+ cells in vivo have the same regenerative capacity as the iPSCs in vitro. “They never show the myogenic potential of those cells and don’t show them giving rise to cardiomyogensis” in vivo, Kotlikoff told The Scientist. “The expression of [cKit], per se, is not sufficient to identify cells as precursors and the further presumption that signaling processes observed in in vitro differentiation experiments limit such cells from undergoing myogenesis in the adult heart, the stage at which clinical regenerative efforts are focussed, is not supported by data,” he added in an email. Hare is involved in two planned clinical trials that will administer cKit+ cells to patients with heart failure. (He founded a company called Vestion that is developing cardiac cell therapies.) Already, a phase 1 trial called SCIPIO, which Hare was not part of, found positive signs of tissue repair among patients given their own cKit+ cells. But as questions were raised about the regenerative abilities of these cells, some advocated to wait on the clinical trials until the biology was worked out. Hare said his study does not explain SCIPIO’s results; rather, it offers some clues as to how researchers can boost the reparative potential of these cells. K.E. Hatzistergos et al., “cKit+ cardiac progenitors of neural crest origin,” PNAS, 112:13051-56, 2015. Contrary to previous reports, cell lineage tracing reveals stem cells in the heart rarely contribute to new muscle. FLICKR, GEORGE SHULKINC-kit cells, which are found in the heart and supposedly act as cardiac stem cells, are the basis of a clinical trial to repair cardiac injury. But a new study published in Nature today (May 7) adds what some researchers are calling “definitive” evidence to the idea that these cells hardly ever produce new heart muscle in vivo. Using genetic lineage tracing in a mouse, a team led by Jeff Molkentin of Cincinnati Children’s Hospital Medical Center found that, while c-kit cells readily produce cardiac endothelium, they very rarely generate cardiomyocytes. “The conclusion I am led to from this is that the c-kit cell is not a cardiac stem cell, at least in term of its normal, in vivo role,” said Charles Murry, a heart regeneration researcher at the University of Washington who was not involved in this study. The latest findings add to a string of recent setbacks for advancing the use of these cells as a therapy—including a retraction and an expression of concern regarding two publications and an institutional investigation of one of the leaders in the field, Piero Anversa at Harvard Medical School. “There’s been a tidal wave in the last few weeks of rising skepticism,” said Eduardo Marbán, an author of the new study and a cardiologist at the Cedars-Sinai Heart Institute in Los Angeles. Still, he said, the dispute is not settled, and many stand by the regenerative power of these cells. 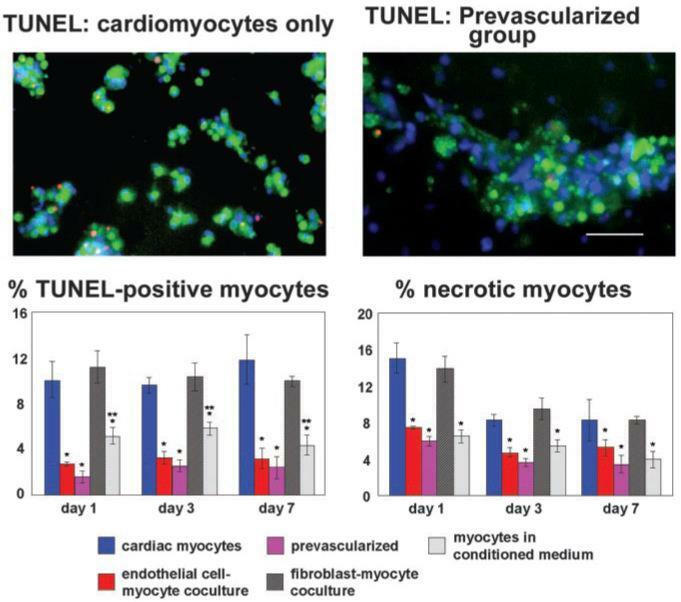 Research led by Anversa has shown that c-kit cells—cardiac progenitor cells expressing the cell surface protein c-kit—can produce new cardiomyocytes. Anversa and others have helped usher the cells into clinical trials to test whether they might help repair damaged cardiac tissue. Molkentin’s study did not address why there’s a discrepancy between his results and those of Anversa and another leader in the c-kit field, Bernardo Nadal-Ginard, an honorary professor at King’s College London. Last year, Nadal-Ginard and his colleagues showed in Cell that heart regeneration in rodents relies on c-kit positive cells and that depleting these cells abolishes the heart’s ability to repair itself. Nadal-Ginard toldThe Scientist that technical issues with Molkentin’s mouse model could have affected his results, causing too few c-kit cells to be labeled. Additionally, “the work presented by Molkentin used none of our experimental approaches; therefore, it is not possible to compare the results,” Nadal-Ginard said in an e-mail. Molkentin’s paper only serves to darken the cloud that has moved over Anversa’s work on c-kit cells. Last month, a 2012 paper in Circulation by Anversa’s team was retracted because the data were “sufficiently compromised.” Days later, The Lancet published an expression of concern regarding supplemental data in the published results from the human clinical trial using autologous c-kit cells. Harvard Medical School and Brigham and Women’s Hospital continue to investigate what may have gone wrong. Meanwhile, Marbán is advancing another type of stem cell, called cardiosphere-derived cells, through human clinical trials to try and treat tissue damage after a heart attack. Marbán said he had been a true believer in c-kit cells, until the data started mounting against them. “The totality of the evidence now says the c-kit cell is no longer a cardiomyocyte progenitor,” he told The Scientist. 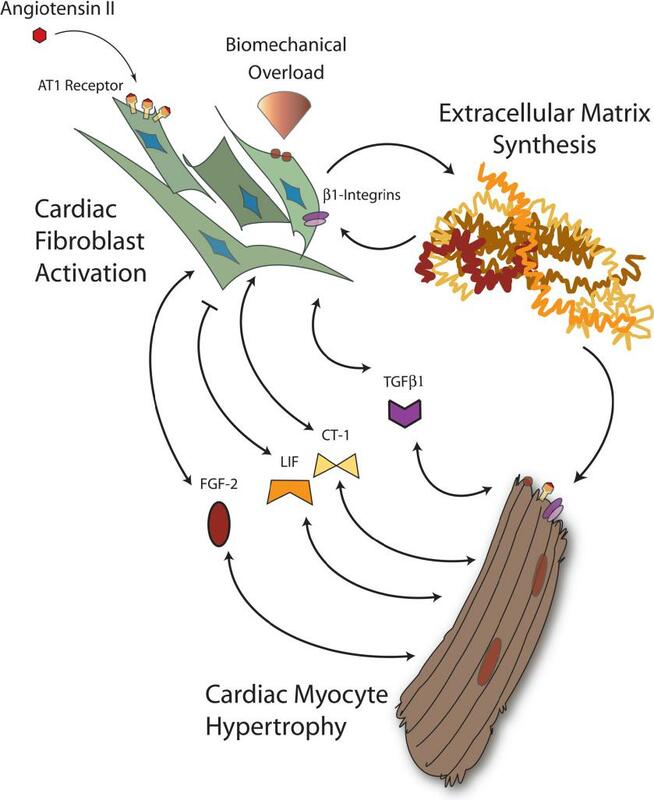 If c-kit cells don’t produce new cardiomyocytes, as Molkentin and Marbán assert, where does that leave the clinical trial? Murry said that just because the preclinical, mechanistic basis for the human study is foundering, any promising clinical results are not to be dismissed. “Those results can be considered independent,” he said. Molkentin said it’s possible that c-kit cells work in unknown ways to repair heart tissue. He noted that clinical treatment involves high levels of c-kit cells immersed in culture conditions. “Perhaps these cells act a little different,” Molkentin said. J.H. van Berlo et al., “c-kit1 cells minimally contribute cardiomyocytes to the heart,” Nature, doi:10.1038/nature13309, 2014. A high-resolution genetic lineage-tracing study in mice reveals that cKit identifies multipotent progenitors of cardiac neural crest (CNC) origin. 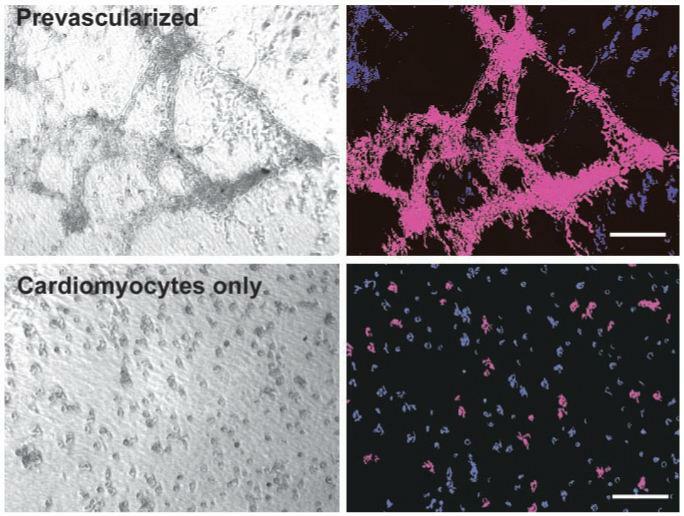 Normally, the proportion of cardiomyocytes produced from this lineage is limited, not because of poor differentiation capacity as previously thought, but because of stage-specific changes in the activity of the bone morphogenetic protein pathway. Transient bone morphogenetic protein antagonism efficiently directs mouse iPSCs toward the CNC lineage and, consequently, the generation of cKit+ CNCs with full capacity to form cardiomyocytes and other CNC derivatives in vitro. These findings resolve a long-standing controversy regarding the role of cKit in the heart, and are expected to lead to the development of novel stem cell-based therapies for the prevention and treatment of cardiovascular disease. The degree to which cKit-expressing progenitors generate cardiomyocytes in the heart is controversial. Genetic fate-mapping studies suggest minimal contribution; however, whether or not minimal contribution reflects minimal cardiomyogenic capacity is unclear because the embryonic origin and role in cardiogenesis of these progenitors remain elusive. Using high-resolution genetic fate-mapping approaches withcKitCreERT2/+ and Wnt1::Flpe mouse lines, we show that cKit delineates cardiac neural crest progenitors (CNCkit). 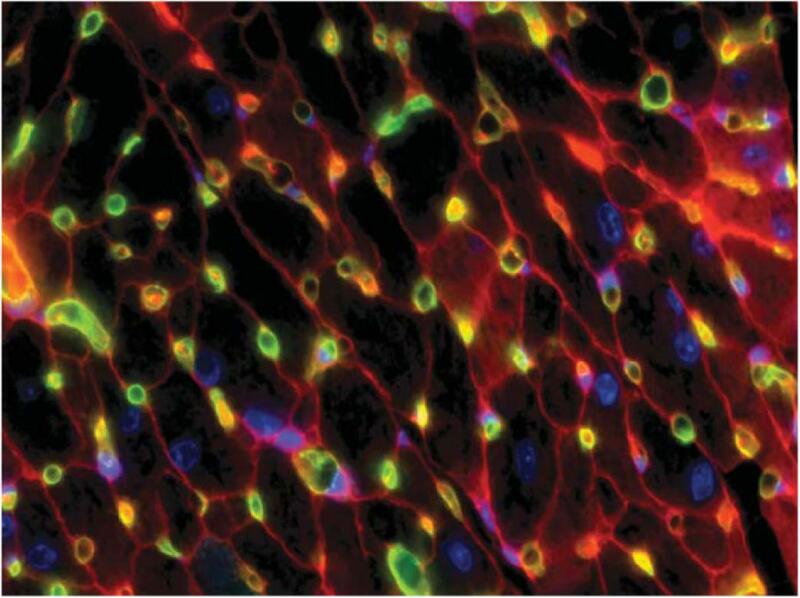 CNCkit possess full cardiomyogenic capacity and contribute to all CNC derivatives, including cardiac conduction system cells. Furthermore, by modeling cardiogenesis in cKitCreERT2-induced pluripotent stem cells, we show that, paradoxically, the cardiogenic fate of CNCkit is regulated by bone morphogenetic protein antagonism, a signaling pathway activated transiently during establishment of the cardiac crescent, and extinguished from the heart before CNC invasion. 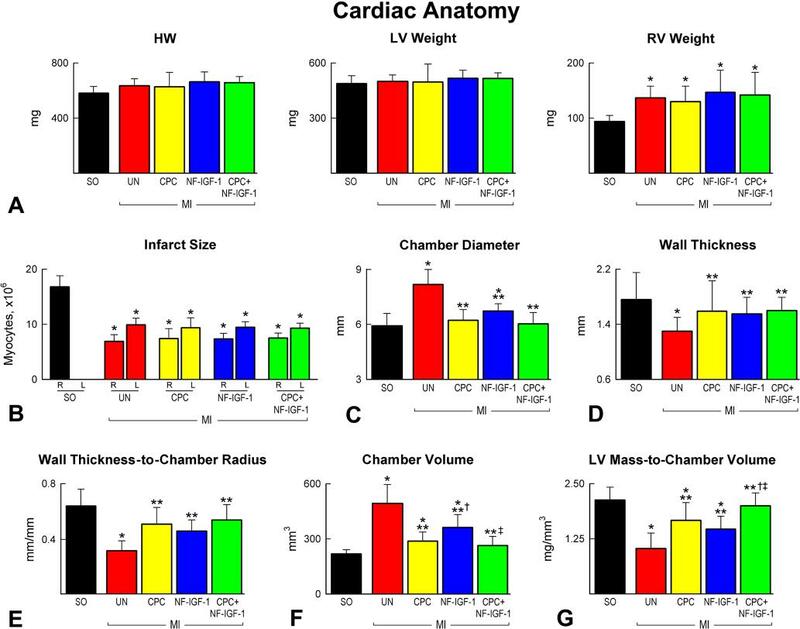 Together, these findings elucidate the origin of cKit+ cardiac progenitors and suggest that a nonpermissive cardiac milieu, rather than minimal cardiomyogenic capacity, controls the degree of CNCkit contribution to myocardium. Morphological changes in mitochondria have been observed in several human diseases including myopathies, diabetes mellitus, liver diseases, neurodegeneration, aging, and cancer. Ong et al (2010) studied neonatal rat ventricular myocytes as an experimental model of aging and concluded that the interplay between mitochondrial fission and autophagy controls the rate of mitochondrial turnover. A disturbance in the balance is observed in aging heart cells resulting in giant mitochondria. This observation is an indication that mitochondrial morphology is connected to pathogenesis of cardiac disease. 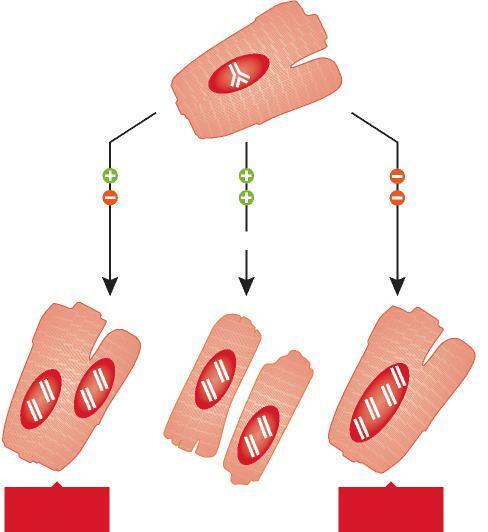 http://www.ncbi.nlm.nih.gov/pubmed/20631158 Thus, it is important to understand the mechanism of mitochondrial dynamics in order to correlate it with the development of cardiovascular diseases. The shape of mitochondria is very dynamic in living cells, constantly interchanging between thread-like and grain-like morphology through what we know now as the fusion and fission processes, respectively. The fusion and fission processes together with the mitochondrial movement have been termed “mitochondrial dynamics”. Nucleoids, the assemblies of mitochondrial DNA (mtDNA) with its associated proteins, are distributed during fission in such a way that each mitochondrion contains at least one nucleoid. Mitochondrial fusion is a complex process that involves the fusing together of four lipid bilayers. Proteins involved in the mitochondrial fission and fusion have been discussed in an earlier post published on October 31, 2012. 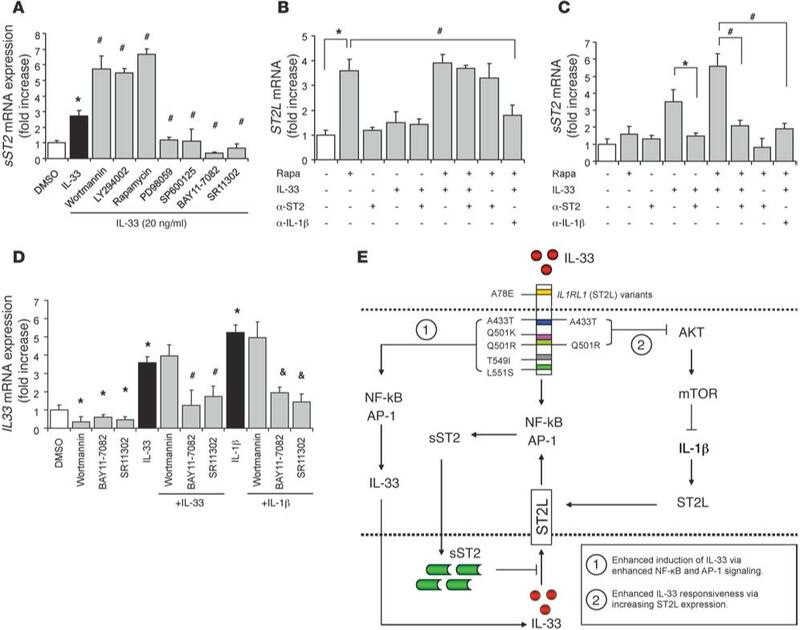 Mitochondrial fusion requires two 85kD-GTPase isoforms mitofusin1 (Mfn1) and mitofusin2 (Mfn2). 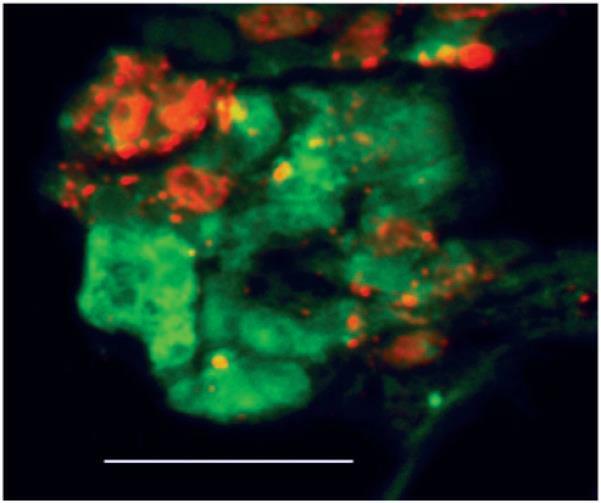 Mfn1 and Mfn1 are both anchored to the outer mitochondrial membrane. 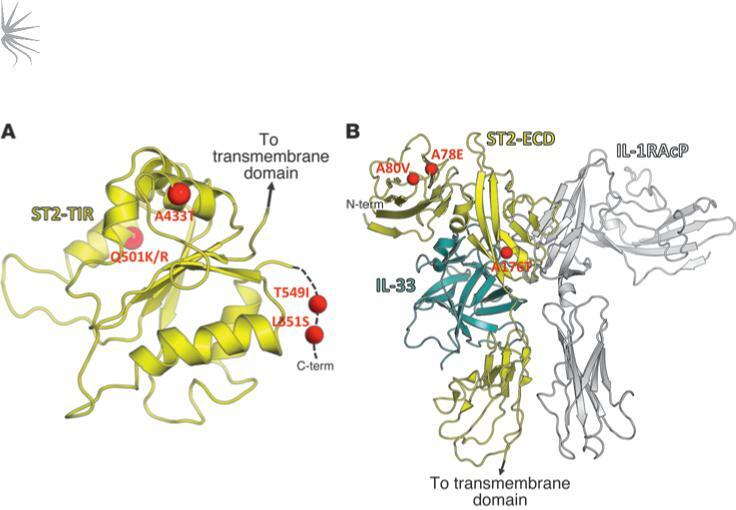 They contain – two transmembrane domains connected by a small intermembrane-space loop, a cytosolic N-terminal GTPase domain and two cytosolic hydrophobic heptad-repeat coiled-coil domains. The coiled-coil domains of Mfn1 and Mfn2 help in tethering adjacent mitochondria in both homo-oligomeric and hetero-oligomeic fashion. The fusion process requires GTP hydrolysis and the cells where Mfn2 had a GTPase mutation; mitochondria were not able to undergo fusion even after tethering. 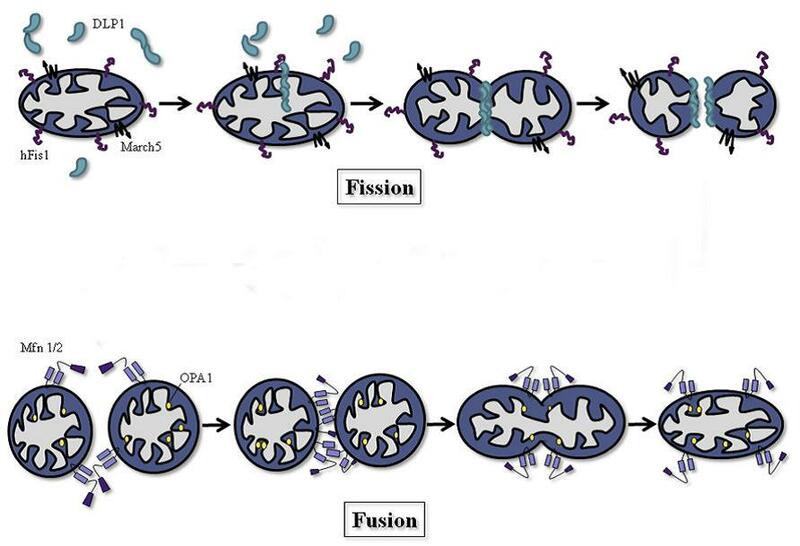 Mitochondrial fission and fusion have been illustrated in Figure 1. Mitochondrial fission is opposite of the fusion process. Mammalian mitochondria undergo fission by the interaction of two proteins: dynamin-like protein 1 or dynamin-related protein 1 (DLP1/Drp1), an 80–85-kD cytosolic GTPase, and human fission protein 1 (hFis1), a 17-kD outer mitochondrial membrane anchored protein. Mitochondrial fission too requires GTP hydrolysis. DLP1 mainly localizes in the cytosol and with the help of hFis1, DLP1 is recruited to the constriction sites of the membrane. DLP1 translocation depends on actin and microtubules and once inside, DLP1 oligomerizes into a ring around the mitochondrion. The self-assembly of DLP1 stimulates the final step of fission which is disassembly and it requires GTP hydrolysis. Additional information on different aspects of mitochondria could be found articles published earlier in the Pharmaceutical Intelligence webpage. In cultured cardiovascular cell line the mitochondria are arranged in a filamentous network and are highly dynamic, constantly undergoing fusion and fission. Similar mitochondrial network is observed in vascular smooth muscle cells, cardiac stem cells, and neonatal cardiomyocytes. Thus, these cell types have been used to study mitochondrial dynamics. Electron micrographs of adult cardiac muscle cells, especially ventricular myocytes, show that mitochondria are numerous, making up about 35% of the cell volume, and that mitochondria are highly organized and compacted between contractile filaments and next to T-tubules. This crystal-like pattern of mitochondria in adult ventricular myocytes raises an interesting question- Do the mitochondria in these cells also undergo physiological fission, fusion, and movement just like other cell types? Whether the crystal-like lattice arrangement restricts their movements and prevents them from undergoing fusion or fission is unclear. It has been speculated that the fission and fusion processes might occur at a slower rate because of the tight packing. A four-dimensional (x, y, z axis and time) live-cell imaging is needed to detect possible movements like mitochondria winding slowly through the myofibrils in the third dimension. Figure 2. 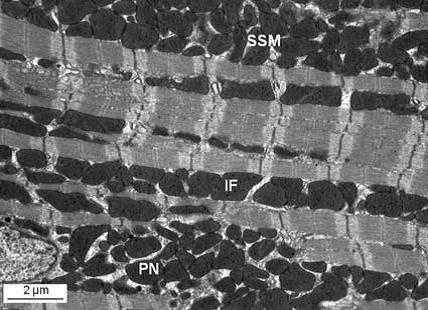 Representative electron micrograph of adult murine heart depicting the three subpopulations of mitochondria: perinuclear (PN) mitochondria; interfibrillar (IF) mitochondria; and subsarcolemmal mitochondria (SSM). 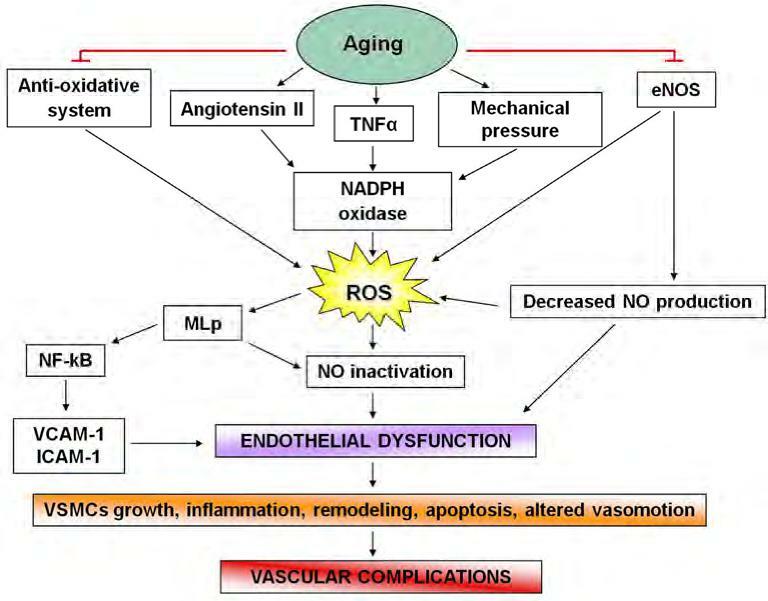 Photo credit: Ong et al, Cardiovascular Research (2010). Expression of fission/fusion proteins in adult heart: Interestingly, it has been observed that proteins required for mitochondrial dynamics including fission and fusion proteins is abundantly present in the adult heart and would have been active during cardiomyocyte differentiation to ensure the unique spatial organization of the three different subpopulations of cardiac mitochondria. Several studies suggest the existence of fission and fusion proteins in the adult heart. Mfn1 and Mfn2 fusion proteins have been found to be expressed in highest amounts in the heart compared to that in human tissues of pancreas, skeletal muscle, brain, liver, placenta, lung, and kidney using both Northern and Western blot analysis. Infact, Mfn2 mRNA was found to be abundantly expressed in heart and muscle tissue but expressed only at low levels in other tissues. 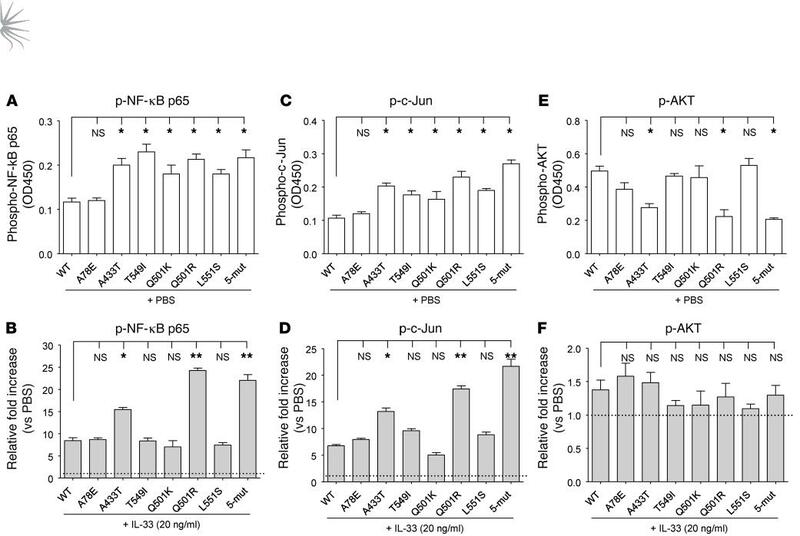 Mfn1 and Mfn2 expression has also been confirmed in heart tissue of rat and mouse by RT-PCR. hFis1, a fission protein, has been shown to be ubiquitously expressed in isolated rat mitochondria in heart tissue apart from several other tissues. DLP1 mRNA, coding for a fusion protein, have been detected in high levels in several adult tissues including heart, skeletal muscle, kidney and brain. OPA1 codes for another fusion protein and four transcripts of OPA1 have been detected in adult mouse hearts. Abnormally small and disorganized mitochondria – observed in endstage dilated cardiomyopathy, myocardial hibernation, cardiac rhabdomyoma, and ventricular-associated congenital heart diseases. Disorganized clusters of fragmented mitochondria – observed in Tetralogy of Fallot and are located away from contractile filaments, along with having a very small diameter measured to be 0.1 μm as observed in the electron micrographs. 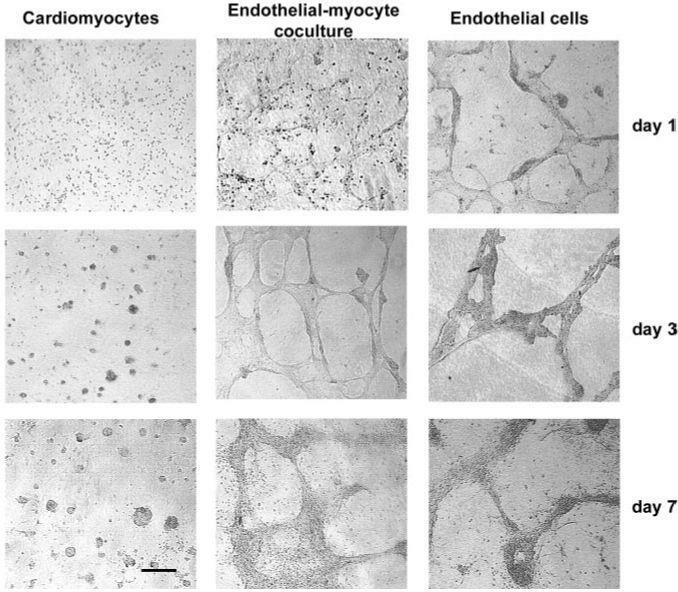 Big and defective mitochondria – observed in senescent cardiomyocytes. Table 1: Studies implicating changes in mitochondrial morphology in cardiovascular diseases, Adapted from Ong et al, Cardiovascular Research (2010). 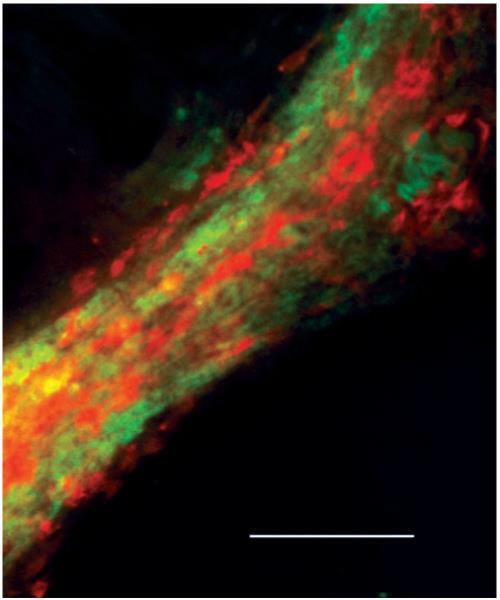 Mitochondria are highly organized and compacted between contractile filaments (interfibrillar) or adjacent to the sarcolemma (subsarcolemmal) in adult mammalian cardiomyocytes. However, during heart failure, interfibrillar mitochondria may lose their normal organization. There is also a reduction in size and density of interfibrillar mitochondria in rodent models of heart failure. It was recently reported that OPA1 is decreased in both human and rat heart failure. Electron microscopic data showed an increase in the number and decrease in the size of the mitochondria in a coronary artery ligation rat heart failure model. Inhibition of fission in cultured neonatal ventricular myocytes by overexpression of dominant negative mutant form of Drp1, Drp1-K38A, prevents overproduction of ROS, mitochondrial permeability transient pore formation and ultimately cell death under high glucose conditions. In cultured neonatal and adult cardiomyocytes, cytosolic Ca2+ overload induced by thapsigargin (Tg) or potassium chloride (KCl) resulted in rapid mitochondrial fragmentation. Calcium overload is a common feature in heart failure, which might lead to increase in fission contributing to decrease in energy production in the failing heart. In H9c2 cells, reduction in OPA1 increased apoptosis both at baseline and after simulated ischemia, via cytochrome c release from mitochondria. Drosophila heart tube-specific silencing of OPA1 and mitochondrial assembly regulatory factor (MARF) increased mitochondrial morphometric heterogeneity and induced heart tube dilation with profound contractile impairment. In this model, human MFN1/2 was rescued MARF RNAi induced cardiomyopathy. 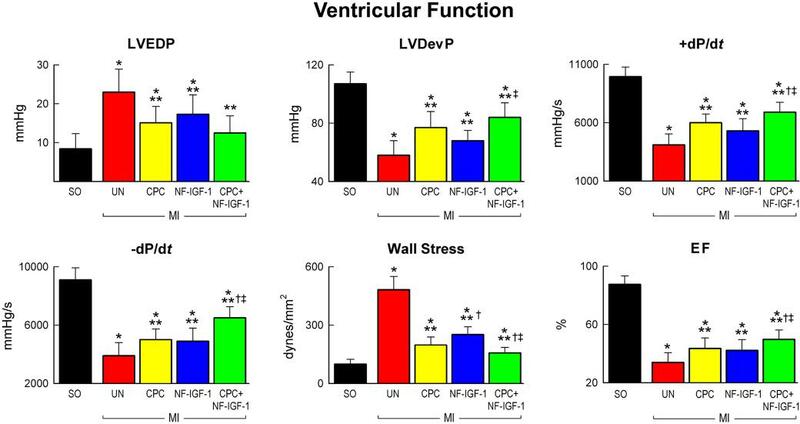 MFN-2-deficient mice have mild cardiac hypertrophy and mild depression of cardiac function. Also, mitochondria of cardiac myocytes lacking MFN-2 are pleiotropic and larger. However, further research is needed to accurately and fully define the role of abnormal mitochondrial morphology in heart failure. Those researches might lead to developing new interventions for treating abnormal mitochondrial function based diseases. Williamson CL, Dabkowski ER, Baseler WA, Croston TL, Alway SE, Hollander JM. Enhanced apoptotic propensity in diabetic cardiac mitochondria: influence of subcellular spatial location. J Physiol Heart Circ Physiol. 2010 Feb;298(2):H633-42. Chung S, Dzeja PP, Faustino RS, Perez-Terzic C, Behfar A, Terzic A. Mitochondrial oxidative metabolism is required for the cardiac differentiation of stem cells. Nat Clin Pract Cardiovasc Med 2007;4(Suppl. 1):S60–S67. Hom J, Yu T, Yoon Y, Porter G, Sheu SS. Regulation of mitochondrial fission by intracellular Ca(2+) in rat ventricular myocytes. Biochim Biophys Acta 2010;1797: 913–921. Makino A, Scott BT, Dillmann WH. 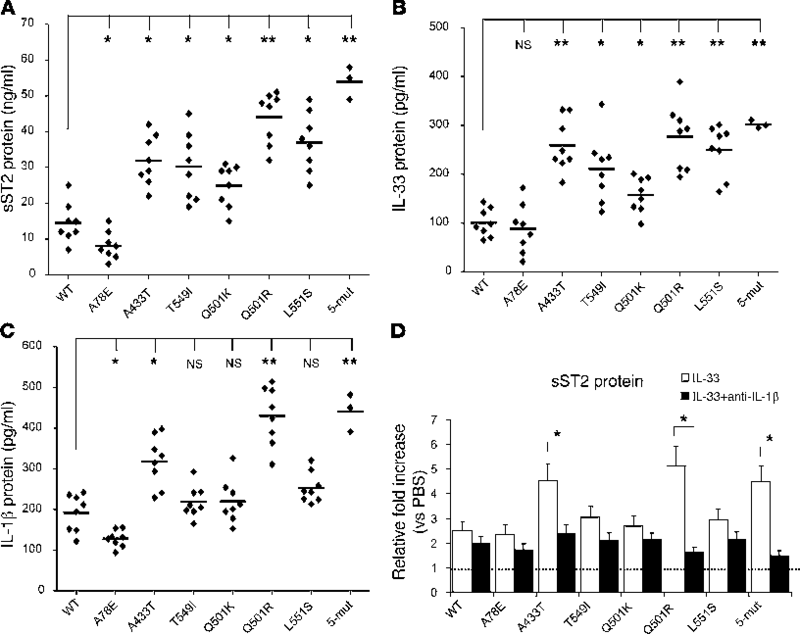 Mitochondrial fragmentation and superoxide anion production in coronary endothelial cells from a mouse model of type 1 diabetes. Diabetologia 2010;53:1783–1794. Williamson CL, Dabkowski ER, Baseler WA, Croston TL, Alway SE, Hollander JM. Enhanced apoptotic propensity in diabetic cardiac mitochondria: influence of subcellular spatial location. Am J Physiol Heart Circ Physiol 2010;298:H633–H642.